Join Noah Mazé for 3 days of yoga practice and play in St Paul / Minneapolis in May 2019! Every pose is in its optimal state when it can be embodied with equal parts of stability and ease (sthira / sukha), but all to often we get bogged down with contradictory alignment cues and actions that leave us overwhelmed and confused, both physically and mentally. 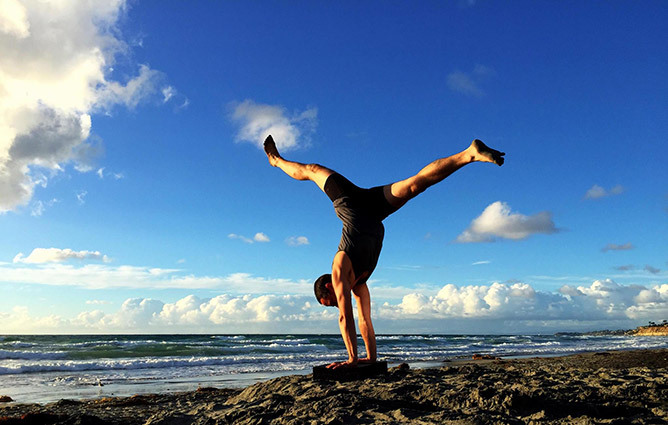 In this compelling workshop, through lecture, prop work, and experiential learning, Noah will offer a powerful and logical, step-by-step process for understanding, practicing and teaching optimal asana alignment. This session is geared toward dedicated students and yoga teachers eager to understand more fully the applications of anatomy, kinesiology and biomechanics behind asana alignment, sequencing strategies and pose improvement. Yoga mimics life. And life is full of ups and downs and twists and turns and the invitation to be your greatest self throughout. In this full spectrum sequence you will do a bit of everything; sun salutations, standing poses, forward folds, back extensions, twists, inversions and meditation. You will build strength while you exercise the full range of mobility in your body. This workshop will feature step-by-step sequencing, clear instructions, attention to alignment and stages appropriate for all yogis of all levels. This well-rounded vinyasa flow class will heat you up just to the point of liquefaction. Beginning with opening poses and pranayama, we will progress into sun salutations, linked standing pose flows, build core and shoulder strength in basic arm balances, turn in with forward folds and round it all out with some basic backbends. This all levels workshop is not about fancy trick poses, but rather maintaining focus and alignment within the fluidity of movement and the rhythm of your breath through all poses and transitions. Cultivate resiliency in your body and spirit in this workshop focusing on twists, side bending and back bending postures and actions. You will be deeply nourished as you learn to bend with appropriate tensile strength as you stabilize and mobilize your spine, pelvis and hips. This yoga workshop will strengthen your deep core stabilizers as well as your more global core muscles as we circumambulate 360 degrees around your torso and pelvis with strengthening poses and drills. We begin with the pelvic floor and transverse abdominus, into supine core strengtheners and hip openers, boat pose and plank pose variations, inner thigh strengtheners, outer hip stabilizers, back strengthening poses and culminating arm balances. Activate your core and give your shoulders some bonus strengthening! All levels; come ready to work hard and have fun.